Capturing individual style in rooms is key to creating happy spaces that we love being in. But I think that making sure rooms reflect our values is equally important. Most people today care about the environment and their impact on it. When we’re renovating houses, we have to consider the environmental impact of the choices we make. If we do, then we’ll create healthier, happier spaces that reflect our growing environmental awareness. Using materials that don’t off-gas and and lead to health problems. The list could go on but rather than getting bogged down in making everything eco you need to work out the things that matter most to you. In our house there are lots of things that I wish could be more eco-friendly but sometimes there just isn’t the time or the money. The things that I have done, I’m proud of and am thrilled with the effect, so here they are to inspire you. 1. Scaffold planks. They’re cheap, sustainable, versatile and can be waxed, oiled or stained to beautiful effect. They tend to be 35mm thick and so are perfect for chunky shelving or worktops. I’ve used them in many different guises – worktops, a boot room bench, my son’s bedhead, kitchen shelving – and they’ve never failed to disappoint. Most carpenters are happy to use them and there are lots of companies online who make shelf brackets to support them e.g. Bob’s Brackets. 2. Reclaimed encaustic tiles. Maitland & Poate source stunning cement tiles reclaimed from the palaces and villas of Andalucia. They are thicker than most modern tiles which makes them excellent for underfloor heating because they retain heat brilliantly. I’ve also used them on a larder worktop as an alternative to slate because in an unheated space they keep things cool. They’re fabulously durable (you’d be hard pushed to find anything solid enough to crack them) and with a quick coat of Ecoprotec Natural Finish sealer they repel stains well. Other suppliers include Bert & May, English Salvage and Alhambra Home. 3. Reclaimed brick slips. These are old bricks that have had the tops sliced off them to form a 2cm brick tile. They can be laid on floors or walls and one of the things I love most about them is that they NEVER show the dirt. A couple of coats of Stormdry masonary protection cream will stop them being porous. There are lots of companies supplying reclaimed bricks but I mainly use Cawarden who have an excellent range and are reasonably priced. 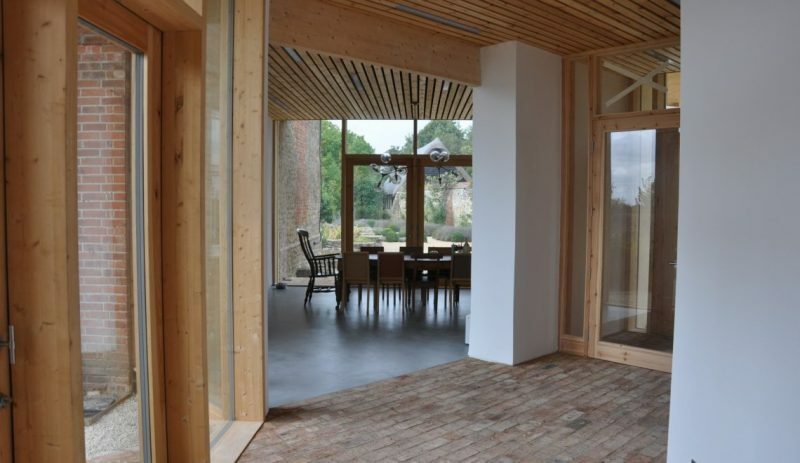 In our house we’ve continued the same brick, in its full rather than slip form, onto the outside patio to create continuity and flow between the inside and outside space. The same reclaimed bricks used in their full form outside. Edward Bulmer – a beautiful and growing colour range; their wall emulsion has a smooth, wipeable finish; and I’ve found their Traditional Oil Eggshell to be particularly durable on woodwork although it takes a while to dry. Auro – it has the same ingredients as Edward Bulmer but a more basic colour range and lower price tag. Keim – a German paint which is well known in architectural circles and which is mineral silicate based with no solvents or petro-chemicals. Their Ecosil wall paint has a chalky matt finish which bounces light around beautifully but it marks easily so it’s not ideal for high traffic areas. Keim Innostar which at the moment is only available in white is less chalky and more forgiving in terms of marks. You can read about these paints and others in more detail in previous posts (November 2016, June 2017 and June 2018). 5. Wallpaper. I’m a big fan of wallpaper because in high traffic areas it can be more forgiving than paint and in old houses it helps conceal cracks and bumps. However, it feels as if the wallpaper industry has gone backwards in terms of eco-friendliness. A number of years ago Graham & Brown commissioned young artists from Central St Martins to design their Eco Collection but sadly this is no longer produced. Brands that I’ve found to be the most eco-friendly are MissPrint, Blithfield, Little Greene, Farrow & Ball and Mini Moderns – you can read about all of these in this previous post. If you’re worried about indoor air quality don’t buy vinyl or coated paper because it contains lots of chemical additives including PVC and cadmium (a nasty substance). Also, if you’re going to the effort of using eco-friendly wallpaper use a natural, non-toxic paste such as Auro 389 which performs as well as any of the big brands. 6. Use stainless steel in your kitchen. This has so many sustainable qualities – it’s kept clean and hygienic with the wipe of a cloth; it’s designed to last for decades; it doesn’t stain or burn (although it does scratch); and it is the champion product of recycling (in the UK 90% is recycled into new stainless steel). It gives a very clean, industrial look but it’s easy to soften the effect by interspersing it with wood and adding plants and other warm coloured metals. 7. Reclaimed beam oak. Beautiful wide oak floorboards from a disused school in the Welsh valleys were my dream but they were coated in bitumen, which is a pain to remove, and prohibitively expensive. On the hunt for an alternative, I came across re-sawn beam oak – boards cut from old oak beams (usually from France) – which are much more reasonably priced. Beam oak boards come in varying widths and lengths; they have beautiful old knots and grains; they’re less susceptible to warping than new floorboards; and they can be fixed using secret nails rather than solvent-based glues. I got ours from Chaunceys but the New & Reclaimed Flooring Company also sells them. With LEDs it’s the lumens which are important, not the Watts. The amount of lumens you need all depends on the room and purpose of the lighting. Here’s an excellent article from the Fritz Fryer blog to help. For non-directional bulbs I buy bulbs with a lumen of between 350 and 500, never higher. Buy on-line because the choice and price is better. Also, the people on the end of the helpline really know their stuff. I bought most of my bulbs through Easy Lighting who stock Calex bulbs which I’ve found to be excellent. In terms of shades, there are a surprising number of sustainable options. Antique and vintage lights are as environmentally friendly as you get. There’s loads of choice on line and a particularly favourite supplier of mine is Norfolk Decorative Antiques. I bought this 1970s French glass globe light from them for our bathroom. There are also good options for shades made from recycled material. Nkuku’s range of Jatani lampshades are made from recycled metal. They come without the cable and bulb fitting but Dowsing & Reynolds do their ‘customise a light option‘ which allows you to choose cable in different colours and lengths, bulb fittings and ceiling roses. Pooky do a range of shades and lamps made from recycled glass. There are lots of lighting designers experimenting with sustainable products. Cork is having an interiors revival at the moment – read Karen Knox’s post ‘Cork is for life’ – with John Lewis and Naken selling cork lampshades. Natural fibre products such as cork, bamboo, rattan and wicker are eco-friendly because they support ancient craft techniques, prevent deforestation and are biodegradable at the end of their life. They also have much lower carbon footprints than heavily processed materials. If you can’t find a light that’s sustainable enough for you then design your own. The light below was made from an old gatepost that I found in the field which I wrapped different lengths of cable (from Dowsing & Reynolds) around and then got my electrician to connect to box transformers that sit on the top. I haven’t yet mastered the art of photographing lights so the picture really doesn’t do it justice but you get the idea of the rustic, reclaimed element.